8' x 7' x 6.5'. 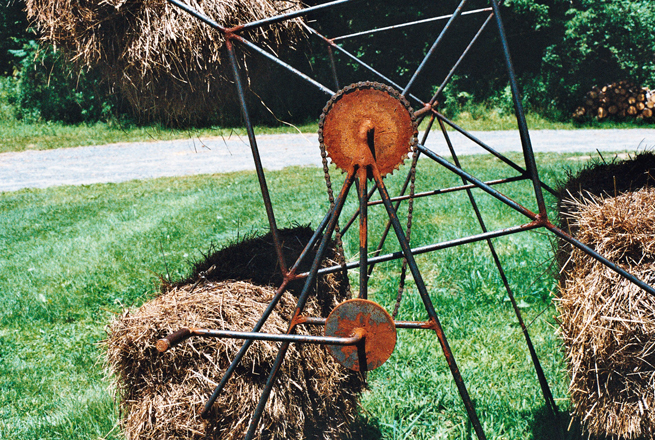 Hay and fabricated steel. Solution For My Father deals with a nostalgic theme of work vs. play. As a child growing up on a farm, my siblings and I learned the meaning of hard work. A hay bale represents the tension between child-like play and the importance of work. The piece comments on functionality in sculpture, while it could represent a piece of farm equipment, yet it serves no real purpose.